"A girlfriend of mine who is vegan was proudly telling me about her new Teddy coat. When I responded that her cuddly warm coat was made of synthetic fibers that will never become biodegradable, she shrugged and said: "I simply don't want anything animal-based on my body." Anything "animal-based" was also hard to find at the Paris Who's Next fashion trade fair. While I browsed through the rows of new winter fashion attire, I mostly saw ready-to-wear synthetic fiber garments and most of the knitwear was made of acrylic, nylon or of blended fabric which, if at all, can only be recycled with difficulty. When I discovered the fur coats from the Korean company Lemonplet by Choyo, I had to touch them twice to be sure it wasn't fake. It's being marketed as a brand new collection. Actually, Choyo specializes in genuine fur coats, said the trade representative, but market pressure forced it to introduce a woven fur line. "Made of very high-quality nylon!" Opting for this material has been worth it, the coats look amazingly real. But be careful, a trompe-l'œil effect like that may place the person wearing the coat at risk. It wasn't too long ago that a colleague got mugged while wearing her (admittedly) genuine fur coat. These three situations above give a fairly accurate picture of how people currently feel about the hot topic of using animal fur in fashion. The vegetarian and vegan movement has not only grown but has also become a cool thing. It's very "in" to pursue a vegan lifestyle and that includes your wardrobe, too. The outcome: many fashion labels are advertising vegan fashion, discontinuing leather, wool, mohair or cashmere from their collections and even luxury brands such as Gucci, Armani, Michael Kors, Calvin Klein and Ralph Lauren, which not too long ago regularly showcased fur coats on their catwalks, are turning their backs on genuine fur. Their rationale: "There are such great fake furs available today, no animals should have to suffer anymore." 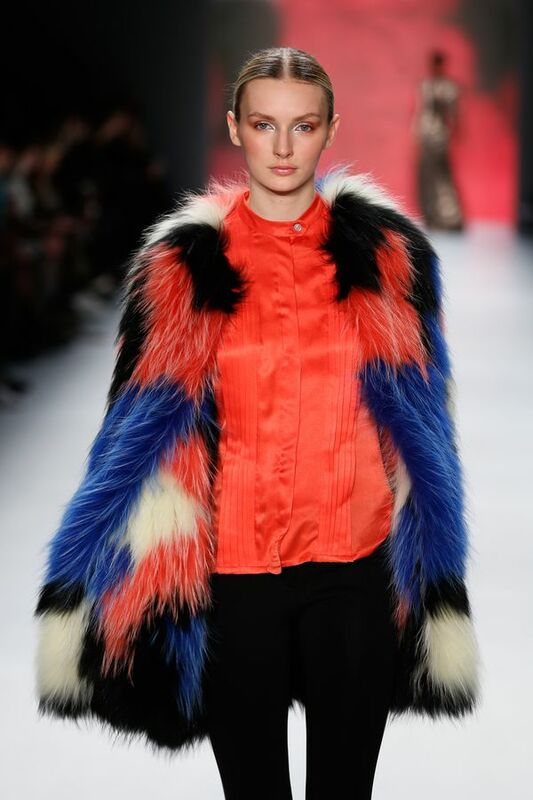 What is left out is that "faux furs" are made from synthetic fibers and are petroleum-based products. Greenpeace declared that one-third of microplastic particles in the ocean can be attributed to washing synthetic textiles, in other words fake fur, acrylic sweaters, polyester clothing or nylon vests. Each washing machine load of petroleum-based fabrics sheds many thousands of unfilterable plastic microfibers, which end up in wastewater and destroy our oceans and its organisms on a massive scale. A report by the German Ocean Foundation says, for example, that ordering a dish with 300 grams of mussels means you will ingest 300 plastic particles. In the meantime, microplastics are even turning up in honey, tap water and in beer. Each year plastic pollution of the seas kills a million birds and 100,000 sea mammals. Add to that the animals dying due to the harmful impact of petroleum extraction, which leaves a yearly legacy of untold soil and water pollution, with large areas and their flora and fauna drowning in oil spills along ramshackle pipelines. A related problem which should not be overlooked is that this so highly vaunted plastic fashion is cheap thanks to the currently low oil prices and is thus being acquired in large numbers. The consequences are devastating: The microplastic pollution of the oceans will increase instead of go down in the coming years, because everybody has a closet full of petroleum fashion. The increasing consumption of cheap synthetic fiber apparel is creating an ever larger mountain of secondhand clothing waste. It is not the solution at all to recommend, as most animal rights groups (like PETA) or vegan organizations are going, that people purchase fake fur, acrylic or polyester to end cruel methods of slaughtering, overbreeding, shearing or plucking of live animals. Quite the contrary! Recommending this only increases the suffering-by other animals and also destroys the environment. The alternative to fur is therefore not fake fur, it's no fur at all. The alternative to leather shoes is not artificial leather, it's no leather at all. It would be desirable to see animal rights groups work together with those opposing plastics so that people are not confused by half-true and contradictory recommendations. The interests of both groups could be met by truly enlightening the general public about what clothes they buy and about biologically degradable alternatives derived from, for example, plants. The alternatives are linen, cotton or synthetic fiber developed from cellulose, such as modal, lyocell or viscose. You don't have to choose between vegan and saying no to plastic. You can choose both. Really!"